he easiest of the great Swiss resorts to get to from Luzern by road or rail along the beautiful Engelberg valley - and home of Olympic ski champion, Dominique Gisin - the "Town of Angels" seems to be overlooked by most international visitors. The exceptions are hard-partying Scandinavians and a lot of incongruous Asian tourists who come to see the mysterious Buddha rock, or the location for the film Lagaan - safe Switzerland often doubles up for the Kashmiri Himalayas in Bollywood movies. The main ski and snowboard area off Titlis has some fabulous slopes and impressive off-piste, including the Laub run, and pretty much everywhere apart from the gentle blue runs at Gershnialp can be accessed without using surface lifts. On the whole the resort is not great for early intermediates or beginners, but there is plenty going on for people who don't want to hit the pistes, or with families, or who are just looking for good après ski. There is a cable car at Brunni which gives access to a small area of pleasant pistes, some off-piste, a couple of mountain restaurants, winter walks, a toboggan run and a few other diversions. Plans to link the pistes at Engelberg with those at Melchsee-Frutt and Hasliberg were put forward a few years ago to create a linked area of 210km of piste, but they were shelved in the face of environmental opposition. Rail buffs will regret the demise of the old cog railway, following the building of the GrafenortEngelberg Tunnel in 2010, but it has reduced journey times from Luzern by 20 minutes. Reputedly Engelberg has one of the highest vertical drops in the Alps, but to do it in one run is not possible unless you take both a steep unbashed trail to Stand and then the excellent off-piste run on the Laub - to take this, turn right after Stand to the top of the Laubersgrat charilift and carry on beyond the lift to the start of the Laub. The area under Titlis comprises three distinct areas of pistes - the area on Titlis itself, the surface-lift and inconvenient Gerschnialp area at the half-way station on the gondola, and the wonderful runs and gentle off-piste off the Jochstock. To get to the latter area you need to take the Trübsee Hopper across a frozen lake, and from there you can also take a pisted run (with some flat sections) back down to the bottom station. Be careful in Engelberg going off-piste; on Titlis there are some very dangerous sections if you take a wrong turn, and there are several nature reserves around which are strictly verboten. At the bottom of the marked trail from Klein Titlis there is a good restaurant at Skihütte Stand (+41 639 50 80), and at the end of the Laub run, the excellent Ritz restaurant (+41 637 22 12). The Yucatan, across from the station, is where most people kick-off their evening. 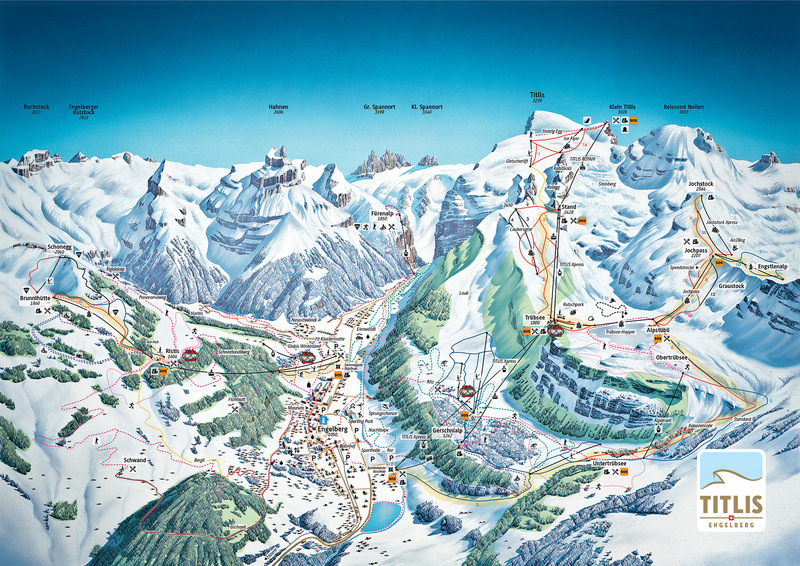 The best destination to access the downhill slopes by public transport in this ski area is Engelberg. The station is 10 minutes from the main Titlis cable car (turn right out of the station), or take the courtesy bus for either Titlis or Brunni. The resort operates the Snow'n'Rail scheme, providing a 20% discount on the combined travel ticket and lift pass. From Zurich the least travel time is 1 hr 49 mins with as few as 1 changes going via Luzern. Typically, an adult one day combined ticket is 119.40 SFr, reduced to 89.00 SFr with a Half-Price card. From Basel the least travel time is 1 hr 49 mins with as few as 1 changes going via Luzern. Typically, an adult one day combined ticket is 137.00 SFr, reduced to 97.80 SFr with a Half-Price card. From Berne the least travel time is 1 hr 53 mins with as few as 1 changes going via Luzern. Typically, an adult one day combined ticket is 145.00 SFr, reduced to 101.80 SFr with a Half-Price card. From Luzern an adult one day combined ticket is 88.20 SFr, or 73.40 SFr with a Half-Price card. Indicative prices are for travel to Engelberg. Click here to find prices for other destinations. Under the combined ticket scheme the additional charge for a two day pass is 50.40 SFr. The road distance from Zurich is around 86 km and the journey time is roughly 1 hr 10 mins. The road distance from Basel is around 131 km and the journey time is roughly 1 hr 40 mins. The road distance from Berne is around 147 km and the journey time is roughly 1 hr 50 mins. The road distance from Geneva is around 310 km and the journey time is roughly 3 hrs 30 mins. Nearby destinations in the region include Meiringen and Melchsee-Frutt. 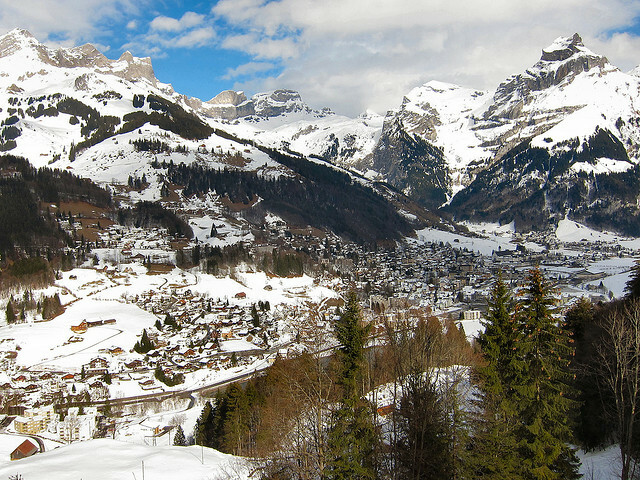 $$$$ Edelweiss, Engelberg (3*) Well regarded family hotel, convenient for town centre. $$$ Elenwäldli, Engelberg (3*) Ranked #12 by Tages-Anzeiger amongst Swiss 3* Hotels. 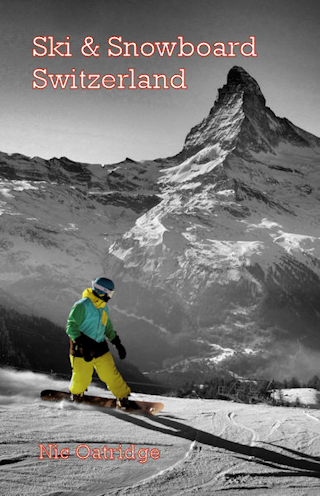 $$ Spannort Hotel & Restaurant, Engelberg (3*) Trip Advisor's best rated hotel in Engelberg. $$ Hotel Belle Vue, Engelberg (3*) In the heart of the Engelberg party scene and next to the railway station.